Tech companies are no strangers to the game of follow the leader -- industry imitation is, after all, the sincerest sign of a successful product. In the case of the Galaxy Note, Samsung's phablet wonder has been enjoying some unexpected popularity in markets abroad and even here in the US. But the company's ownership of that once-niche category is about to be contested by a surge of copycats, spearheaded by the stylus-toting LG Optimus Vu ($866 unlocked). It should go without saying: this 5-inch not-a-smartphone, not-yet-a-tablet has a steep climb ahead if it wants to oust or even claim equal billing with its successful opponent. Of course, the Vu isn't launching an attack on all fronts yet as, right now it's a Korea-only affair running Android Gingerbread. (It redeems itself somewhat with an LTE radio.) Though the competition is welcome, the duel is not an even one, given the Vu's unusual mix of internals: a 1,024 x 768 HD-IPS LCD display, dual-core 1.5GHz Snapdragon processor, 32GB of non-expandable storage, an ample 2,080mAh battery and a region-specific T-DMB TV tuner. But could that be enough to dethrone the current category king, or at least present a viable alternative? Join us after the break as we crack this rectangular nut and winnow out the marketing noise. 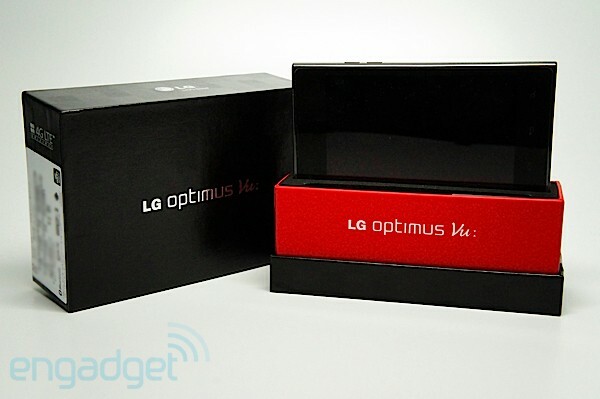 The Optimus Vu is a half-hearted stab at the phablet category pioneered by the Galaxy Note. It's a follower, not a leader, and is best left untouched. How would you rate the Intuition? Product reviews don't usually take into account the beauty of said device's packaging, focusing instead on the actual kit in question. But we have to hand it to LG: the company deserves a solid A+ for presentation. Perhaps as a way to brace consumers for the unconventionally designed handset within, LG tucked the Vu into a narrow, rectangular box that looks it should contain some Trivial Pursuit cards. And it even opens like one too, with the case sliding upwards and off to reveal the handset, manuals, NFC stickers and a bed for the chunky stylus, with the charger and cable hidden beneath the foam. Pull it free from its slumber and you'll immediately notice its exceptional lightness. At 168g (5.93 ounces), it not only weighs 10 grams less than the Galaxy Note, but it also cuts a considerably thinner, 8.5mm-thick (0.33-inch) profile. Those dimensional wins notwithstanding, the Vu does manage to claim a bit more in-hand real estate than we're comfortable with, as it stretches even large hands to the limit with a 90.4mm (3.56-inch) width. It's not a point that can be readily dismissed: you either possess the Hulk-sized paws necessary to cling to this phone or you don't. If you're in the latter camp, you probably shouldn't be eyeing phablets in the first place. "And both hands, now use both hands," Ani DiFranco once famously sang and it's that particular refrain we'd advise the company to adopt in its marketing (for the betterment of consumer education, naturally). This fella requires full manual cooperation to function properly -- how else are you going to use that stylus? Which brings us to what is easily the Vu's biggest flaw: the omission of a slot for stowing the pen. Are you scratching your heads over that one? We're still bewildered. 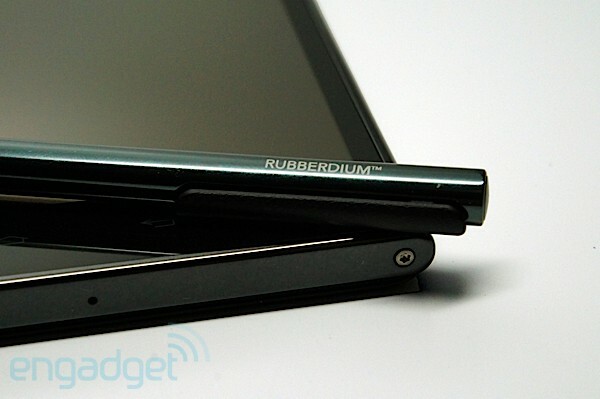 Yes, the included Rubberdium stylus has enough girth to confer a natural hold, but we would've much preferred a slimmer accessory if it could've been conveniently tucked away. Instead, if you intend to make heavy use of this device for note-taking or even stylus-guided navigation, you'll have to remember to take it with you and find a secure place to stash it. It's a quirk we've been unable to overlook -- in practice, it actually gives users a reason to forgo that accessory completely. The Galaxy Note is the taller of the two phablets, but that's to accommodate its larger 5.3-inch screen. The Vu, at 139.6mm (5.5 inches), is not as lengthy, but the generous bezel surrounding its screen contributes to a larger and more unwieldy design. That said, its rounded edges do their best to pinch hit for lack of ergonomic fit. Neither the top nor bottom of the unit benefit from that curving, but the decision to soften the sides goes a long way in diminishing its awkwardness. Only the right side contains any physical buttons (no dedicated camera key here) -- in this case, a two-button volume rocker. Access to the micro-SIM slot is hidden on the opposite edge and requires the use of a pin or pointed object to pry it open. There's no microSD slot to expand the device's storage, but with a healthy 32GB on board, you might not even need it. Up top, you'll find a 3.5mm headphone jack on the left, secondary mic, function button for stylus use, a sliding port for micro-USB, power button and, finally, a retractable T-DMB antenna for Korean TV broadcast reception. 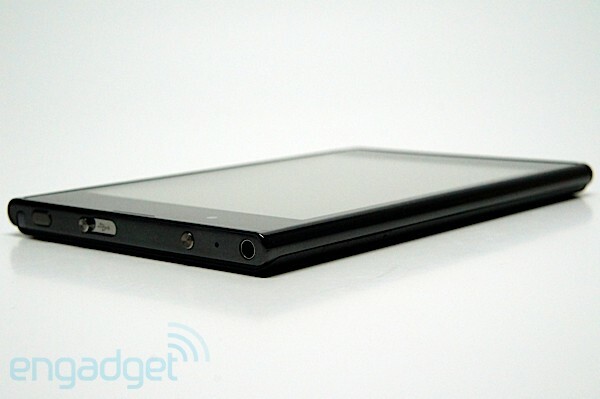 The front face is devoid of any branding, with only a 1.3-megapixel camera and capacitive buttons. If you ask us, LG would've done well to shrink the device down some to eliminate that wasted space. So, it's slim, large and considerably light -- a veritable recipe for slippage, if ever -- which is why LG took care to texturize the Vu's non-removable, plastic back. Does that mean it'll stay put when you're gesturing about in the manner of an over-caffeinated, emotionally irascible Italian? No. In fact, that non-removable backing could've benefited from deeper grooving and a rougher surface. As it is, that backplate tends towards the smooth and slick as opposed to a reassuring, frictional grip -- a sure hazard for the less-coordinated of users. LG's kept the surface scarring to a minimum with a break for the 8-megapixel shooter and single LED flash on the upper left, a large 4G LTE label located midway on the phone's top third, the company's logo a few inches below and two hourglass-like slits for the speaker grill on its left. Admittedly, the Vu's boot sequence has something of an analgesic effect: it subdues your frustration with Google's stale Gigerbread (2.3.6) with a splashy, galactic start-up animation. 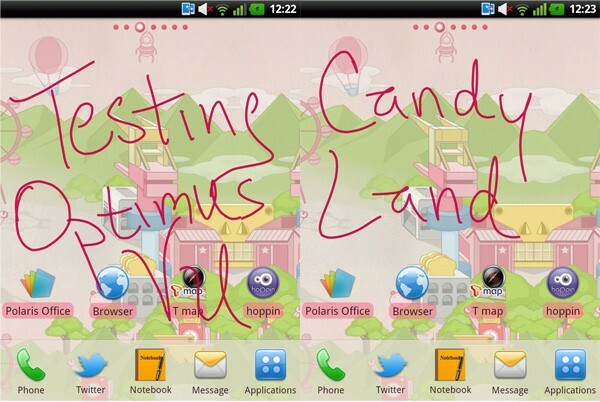 It's all short-lived, though, as you'll soon be greeted by one cartoonish UX, a nondescript, TouchWiz-like experience. Thankfully, that lack of sophistication is offset by the handset's fantastic 1,024 x 768 HD-IPS display -- a great screen that could've been even better, were it not for that 4:3 aspect ratio. We applied one of the more colorful themes and were happy with the fairly even and accurate tonal reproduction -- typical of IPS panels versus common, oversaturated AMOLED screens. Viewing angles are solid, making content easily readable from a variety of angles with only some minor wash-out noticeable. We can't take any mid-2012 phone seriously if it ships with Gingerbread -- skinned 2.3.6, at that. And though an ICS upgrade is reportedly on the way, as of this writing, this is what you're faced with when you power on the Vu. It's a familiar interface for anyone who's ever taken an LG phone for a test run: seven homescreens, a customizable dock and app drawer, power controls in the pull-down notification tray. There are no real surprises here, aside from some pen-optimized features specific to this handset. As you might expect, LG's shoveled crapware galore onto the device (localized bloat for the Korean market) and you can easily shove it out of sight should you so desire. Still, there's no option to uninstall. Buried deep within the settings menu, the company's also made some useful tweaks that give users a bit more control over the device -- an adjustable timeout for the front LED keys, power saver settings and optional aspect ratio correction for apps. After years of buzzing about the promises of NFC, carriers and OEMs appear to have finally gotten their acts together, producing smartphones enabled with both the technology as well as complementary, programmable tags (sold separately, usually). 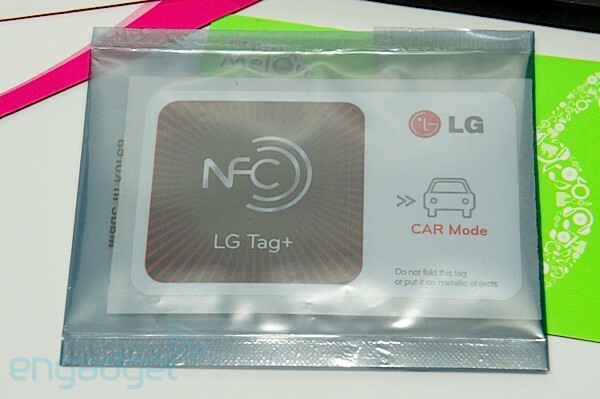 We've already seen Samsung and Sony offer these, and LG's taking a similar tack with Tag+. These stickers, two of which are bundled with the device, lie sealed in a protective envelope -- presumably, to keep them free from outside interference. Both come pre-programmed -- one for Office mode, the other for the car -- but you can easily change that using the accompanying NFC Tag+ app that comes pre-installed on the handset. In addition to Office and Car, there are additional Sleep and User modes. Oddly, LG's separated the plain-Jane NFC app from its own profile-ready Tag+ application. There's not much difference between the two, given the proper app has an option to trigger Tag+ settings, so it makes for an odd and disjointed experience. From within the main NFC app, users can also assign tags with corresponding contact info, URLs, notes, call requests, texts and even calendar events. And yes, you can overwrite the two stickers included in the box. We tested out a few different settings and in our experience, the connection isn't always immediate. You can't really tap to touch and make the connection come to life. Rather, we found that the tech worked best when we placed the Vu on top of a sticker and left it in place. More often than not, however, we had to keep lifting and repositioning the Vu over the tag to get it to properly recognize the command we were trying to execute. 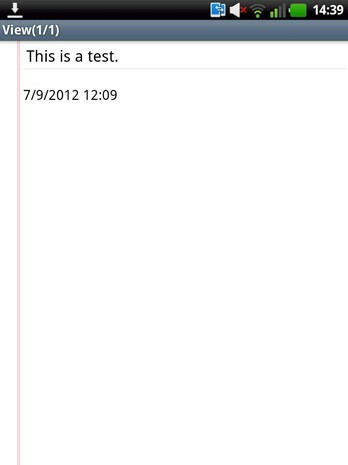 As an aside, we also tested the tags with our Galaxy Nexus and had no problem picking up the associated message. Not only did LG drop the ball in not providing a slot for the stylus, but even the manner in which LG buried the pen settings within the software presents an obstacle to wide user adoption. After navigating through four submenus, you arrive at a screen where you're faced with configuration options: delay time, pen width, pen color, screen transparency. But first -- first, you have to actually select the Handwriting keypad as your default. It's extremely unintuitive and user-unfriendly. In fact, we just happened to stumble upon it as a happy accident during our testing. What LG should've done was create a separate menu option solely for the stylus as a way of guiding intrepid owners through the setup process. There's no way to navigate through the OS using just the pen. Move past that clumsy integration and you're left to parse the actual usefulness of the stylus. Is it on par with the Galaxy Note's? Not at all. For one, the Vu doesn't incorporate a Wacom digitizer like that of its rival, which allows for pressure sensitivity and heightened precision -- instead, you're left with a plain 'ol capacitive screen. 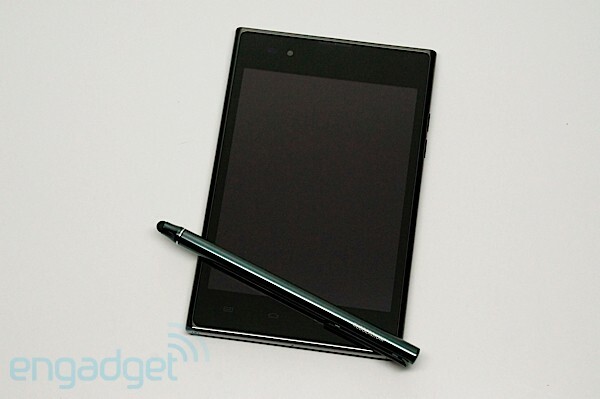 Further, there's no way to navigate through the OS using just the pen. You continually have to interrupt your workflow and use a finger to select the Android capacitive buttons. It's messy and frustrating and you wonder how this device made it out of the company's labs in the first place. If you really want to input text, you can do that from within any messaging application like email or text. It works similar to other devices -- gesture back to delete, forward to space and hook back to the left to enter. As for actual handwriting recognition, we'd give LG's software a B-. Set the delay time to its lowest -- 100ms -- and you'll be in for a maddening exercise in futility. That particular setting was so quick that the system could barely recognize the letter "T," written clearly in uppercase. Bumping the setting to 300ms improved things, although we had to test several stroke orders before we discovered the proper way to input a lowercase "i." And you can forget about apostrophes -- that's for true masochists. 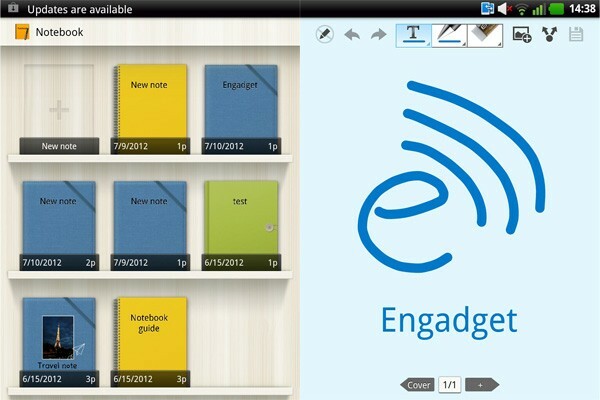 Additionally, there's Notebook and Memo -- two apps LG's designed to take advantage of that Rubberdium stylus. Much like Samsung's S Note, Notebook presents users with pre-existing templates, though you can also opt to just start fresh. From here, you can select your chosen book cover color, choose a title and select your desired "paper" layout and hue. There's nothing really remarkable about it and certainly nothing inherently useful. Once you've settled on a template, you'll see menu options across the top: read-only mode, revert / forward, text, pen, eraser, as well as image, sharing and save options. You can scrawl to your heart's content, add in text boxes and background images from your gallery or take new ones and then send the note off via email or some social network. As for Memo, well, it's pretty self-explanatory and much more bare-bones. Rather than offer a range of templates, the app goes straight for the lined notepad look and takes handwriting-to-text input only. If you're in a rush to jot down some fleeting bit of brilliance, you'd be best advised to forego the pen and smash away at that onscreen keyboard with your thumbs. The recognition software is just too slow to recognize more than one letter at a time without producing a slew of predictive errors. And unlike its companion app, there are no onscreen sharing options here -- for that, you'll have to select the capacitive menu button below. There's one last pen-optimized feature that sidesteps the need for either of those two apps: the ability to write notes on any screen. To do this, LG's included a button atop the device that you might mistake for a dedicated orientation lock. It's not: what it does is place the device into writing mode, snapping a shot of the screen's contents and letting you jot down whatever mumbo jumbo pops into your head. Thankfully, there's a helpful option to disable the background and replace it with a yellow sticky-note backdrop. (You can also save and share these jottings, of course.) Basically, the company's crafted this as a shortcut, albeit a convoluted one, that's meant to bypass the lack of any function keys on the actual stylus. It might've made more sense to side-mount the key on the device, but that could've resulted in a mess of unintended triggers. As it stands, LG made the best design decision it could, but with the phone's gawky dimensions, there's just no elegant way to make use of this phabletry. Exynos, Snapdragon S4, K3 Balong -- the Vu has none of these. Instead, its chipset is an oldie, but relative goodie: a Qualcomm MSM8660 dual-core processor clocked at 1.5GHz, buffered by 1GB RAM and paired with an Adreno 220 GPU. On paper, that might sound like yesteryear's specs, but in practice we didn't encounter any hiccups -- not any that we've been able to replicate, anyway. Only once, when using the native browser, was handset unable to highlight and open links from Google searches, or launch webpages. A simple reboot seemed to fix that issue, and we otherwise enjoyed smooth performance: not once did we suffer a stalled transition, jittery navigation or even a delayed app launch; it all comes off without a hitch at a fluid pace. When we did get the browser up and running without fault, however, full desktop sites loaded at an incredibly slow pace -- just over 30 seconds. On the opposite end of the performance spectrum, pinch-to-zoom was perhaps the smoothest we've seen on a handset, resizing images and text with no loss in detail. One particularly dismal area where the Vu can't keep up is web browsing. 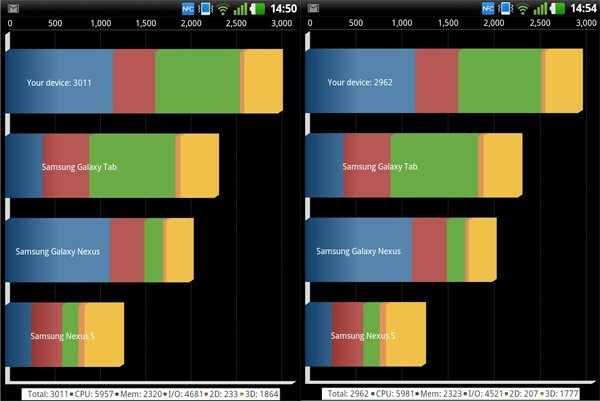 We pitted the Vu against some bedfellows packing the same 1.5GHz Snapdragon S3 CPU and running Gingerbread: the Xperia Ion and Galaxy Note for AT&T. The results? Well, it wasn't pretty for the Vu. In fact, we could pretty much call this a resounding loss, with its graphical prowess being the only saving grace. One particularly dismal area where the Vu can't keep up is web browsing. As we mentioned earlier, it's absolutely abysmal and the corresponding SunSpider score plainly highlights that sluggishness. Its Quadrant score, on the other hand, was nearly even with the Ion's, but still fell short. In all, it was Sony's US flagship that swept our benchmarks. The battery inside the Vu is fairly average at 2,080mAh: it fits somewhere above the Ion's 1,900mAh cell and just below the 2,500mAh power pack inside the AT&T Galaxy Note. Is that middle ground good enough for everyday use? In a word, no. Granted, we couldn't properly test its endurance on a domestic HSPA+/LTE connection given the mix of radios inside (quadband GPRS, HSDPA 2100MHz, LTE 800MHz), so we only had GPRS data (made possible by an AT&T micro-SIM) to lean on. In effect, this meant we were tethered to our home WiFi connection. We were alarmed to notice that after two hours of light browsing, the Vu's charge had dropped by nearly half. With more conservative use, you could probably eke out half a day on a lone charge. Under the duress of our formal rundown test, with Twitter syncing at 15-minute intervals, one push email account active, WiFi and NFC enabled and brightness set midway, the Vu lasted just short of five solid hours -- an extremely unworkable rating for any moderately productive user. You wouldn't necessarily expect the Vu to pack a top-notch camera -- the selling points would seemingly be that screen and stylus -- yet it does. The 8-megapixel module impresses and, unlike other handsets hampered by smaller, non-HD displays, the Vu's expansive 5-inch screen doubles as a portable tableau for your photo handiwork. In practice, the sensor here is extremely intelligent when set to auto, quickly adjusting for white balance, exposure and mode based on your chosen subject. 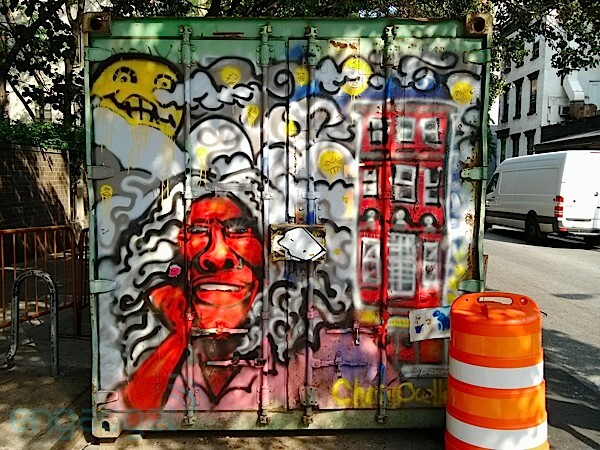 Our initial photo tour had us traipsing about New York on an especially sunny day and, as you can see in the gallery below, the resulting shots offer a lovely mix of balanced color and exceptional detail (up to 3,264 x 2,448 resolution). The custom camera app includes most of the settings you've come to expect from comparable phones: the ability to adjust scene modes, resolution and ISO, as well as add filters and take burst or panorama shots. You can tap to focus, but to actually trigger the shutter you need to press the onscreen software camera key. With such fine photographic performance, you'd naturally anticipate similar results with HD video capture. You'd think that, and you'd be wrong. Even in a brilliant, sun-soaked setting, the Vu couldn't seem to compensate for the abundant amount of light drenching the scene. As you can see during playback, there's a noticeable bleaching that dulls detail, saps nuanced color and results in hazy video. Add to this the compressed, unnatural audio quality, and you'll want to think twice before using the Vu to record your precious moments. There's one fantastic thing about the Optimus Vu: it's not shipping stateside. At least, not that we know of (although there have been hints it could make its way to Verizon). As a daily driver, the Vu is simply a non-starter. It's unfriendly for any real productivity and for most average-sized palms, at that. For a device that requires two hands to operate, you'd think that Rubberdium would be always at the ready, but as we've discussed, you probably won't ever have it on your person. And if you do, you'll quickly become frustrated by the stilted experience of having to switch between pen and finger to navigate the OS. In this sense, as a true phablet, it fails. It fails hard. What's more, its merits as a cameraphone don't make us overlook the stale Android Gingerbread software and the equally dated Snapdragon S3 processor powering it all. In real-world use, most users likely won't find much fault with its speed and mostly fluid performance. Certainly, it doesn't hold a candle to the latest flagships (e.g., the Galaxy S III and HTC One X), and it also falters when pit against its sworn nemesis, the Galaxy Note. As an experimental jab at the in-betweener category, the Optimus Vu is lame and limp-wristed. 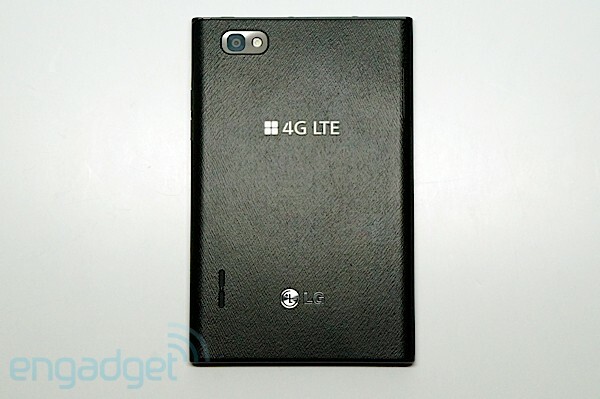 It's as if LG's designers didn't take the creation of this phablet seriously. And in the end, neither should you.